There is some historiographical debate about the extent to which Adolf Hitler was responsible for the Holocaust. What seems likely is that could not have occurred without him. Hitler was born in 1889 in a small Austrian town near the German border, the youngest son of Alois, a petty bureaucrat with a violent temper, and Klara, a calm and gentle woman. The young Hitler was raised and educated a Catholic. Like most Austrians he encountered anti-Semitic ideas as a child, though there is no evidence he embraced them in his youth. Shortly before his 20th birthday, Hitler moved to Vienna, his head filled with dreams of being accepted into the city’s prestigious art academy. But Hitler was a competent rather than talented artist and was twice rejected by the academy. Instead of living the life of a bohemian artist, Hitler was forced to spent the next four years scrounging on the streets of the Austrian capital. At times he made a humble living painting small portraits and colouring postcards for a few coins; at other times Hitler was so destitute that he relied on soup kitchens and doss houses. It was during his miserable youth in Vienna that Hitler’s anti-Semitism intensified. The political atmosphere in the Austrian capital was a hotbed of anti-Semitism and dissatisfaction. Vienna had its share of anti-Semitic newspaper columnists and dozens of street-corner tub-thumpers who ranted and fumed about the “Jewish menace”. Like their German brothers, struggling Austrians found the Jews a ready scapegoat for their troubles. This environment undoubtedly shaped Hitler’s views. Hitler came to admire several Austrian politicians who preached anti-Semitic ideas and slogans, particularly Georg von Schonerer and Karl Lueger. The Jews were an easy scapegoat for Hitler’s personal misfortunes. Later, in his memoir Mein Kampf, Hitler described his life in Vienna as a time of misery – but also of revelation. “I ceased to be a weak-kneed cosmopolitan and became an anti-Semite … at this time of bitter struggle, the streets of Vienna had provided valuable instruction”. In 1913 Hitler crossed into Germany, mainly to escape compulsory military service in the Austrian army. Under threat of arrest and imprisonment, he returned to Austria to enlist in February 1914 but was rejected due to ill health. When World War I erupted in August 1914, Hitler was living in the southern German city of Munich and working as a house painter. He successfully petitioned the Bavarian king for permission to enlist there, despite not having German citizenship. During his war service, Hitler became fascinated with and invigorated by military discipline, camaraderie and German nationalism. He served on the Western Front as a trench runner, risking his life constantly. He was wounded several times and won medals for bravery, including the prestigious Iron Cross. In November 1918, as Hitler lay in hospital recovering from a gas attack, German generals agreed to an armistice that marked the end of the war. Hitler was devastated by Germany’s capitulation. He believed that a German victory was still achievable and that the country had been betrayed by ‘November criminals’: spineless politicians and communist infiltrators. Like other nationalists, Hitler accepted as fact the Dolchstosselegend – the ‘stab in the back’ theory that attributed the German surrender to double-crossers. Again, Jews were positioned at the heart of this conspiracy theory. Even though 12,000 German Jews had died in combat during World War I, nationalists asserted that Jews had been opposed to the war and had undermined and sabotaged the German war effort. Jews were again a convenient scapegoat – this time for the nation’s defeat. Hitler may well have remained another loud but ineffective anti-Semite, had he not joined the Deutsche Arbeiterpartei (the DAP, or ‘German Workers Party’). When he walked into one of its meetings in September 1919, the DAP was just a tiny fringe party with a membership of scarcely four dozen men. Hitler himself had been sent by the army to spy on the group and identify possible communists in its ranks. But instead of spying, Hitler was swept up in the DAP’s indignant political rhetoric and angry speeches – and began to deliver his own, something at which he excelled. 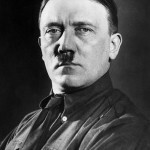 By 1920 Hitler was the DAP’s foremost orator; the topics of his speeches usually focused on the injustices of Versailles and the malevolent influence of Europe’s Jews. Over the coming months the DAP’s membership grew rapidly, in part because of Hitler’s speech-making; and in July 1921 he became its leader. In November 1923 the party – by now called the National Sozialistische Deutsche Arbeiter Partei (NSDAP, later dubbed the ‘Nazis’) staged an attempted coup in Munich. It was a dismal failure and Hitler was imprisoned for five years for treason, a lenient sentence passed by sympathetic judges. He served just nine months of his sentence. On his release from prison, Hitler decided to change tack and reinvent the NSDAP as a contender for seats in the Reichstag, Germany’s national assembly. Though he still despised democracy and parliamentary politics, Hitler believed they could be exploited to provide him with a path to power. Through the mid-1920s the NSDAP reinvented itself, transforming from a small group preaching violent revolution to a legitimate political party seeking voter support. But the Nazis retained their paramilitary branch – the thuggish Sturmabteilung (SA) ‘brownshirts’ – who intimidated political opponents and disrupted democratic elections. The NSDAP worked to expand its membership, developing slogans and propaganda that appealed to Germany’s disaffected classes, particularly farmers, small businessmen and the middle classes. Hitler travelled widely, delivering speeches and meeting influential figures, industrialist and newspaper owners. Hitler toned down the radical rhetoric in his speeches, including his anti-Semitism; instead, he focused on how the Nazis would restore the German economy and revive national prestige. Still, Hitler frequently cited Jewish interference or “meddling” as a source of unrest and disruption in Germany – and a problem that had to be resolved. Hitler rose to power on the back of the Great Depression and the despair it caused in Germany. As unemployment soared and conditions worsened, electoral support for the NSDAP increased. By July 1932 Hitler’s party was the largest in the Reichstag, holding 37 percent of all seats. In January 1933 Hitler was offered the chancellorship of Germany as part of a political deal. Within weeks, a fire in the Reichstag building in Berlin provided Hitler with an ideal pretext for dismantling German democracy and increasing his own power. By July 1933 Germany was a one-party totalitarian state, with Hitler as its dictator. 1. As a young man Hitler struggled to earn a living in Vienna, where he was exposed to anti-Semitic ideas. 2. He joined the German army and fought in World War I, but felt betrayed by the November 1918 ceasefire. 3. Like many others, Hitler felt the surrender of Germany and the harsh war terms were engineered by Jews. 4. He joined a fringe party in 1919, rose to become its leader and transformed it into the Nazi Party. 5. 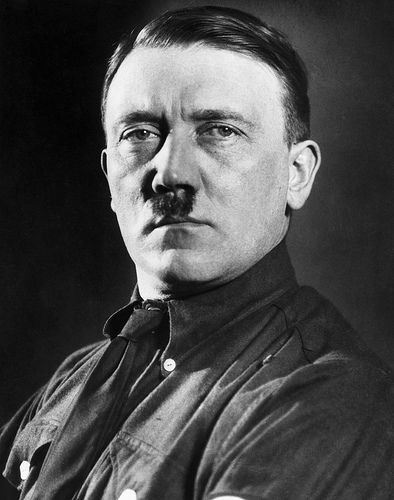 Hitler rose to power in 1933, promising the restoration of German supremacy and action against its Jews.